VENUE ADDRESS: Catton Park, Walton-On-Trent, Derbyshire, DE12 8LN, England. Catton Park is located centrally within the triangle of 3 East Midlands towns, Lichfield, Burton On Trent and Tamworth. 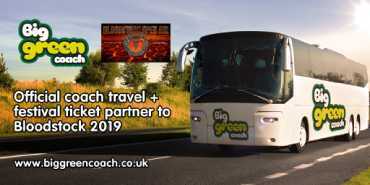 Big Green Coach are once again operating the Official festival shuttle bus service between Lichfield City Train Station and the festival entrance. Our staff are on hand to help with luggage and loading at all times and you can choose to buy your ticket in advance or on the day. 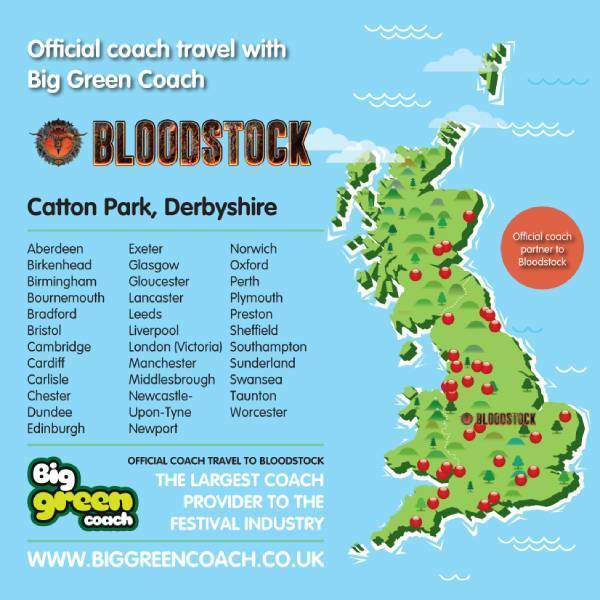 Ditch the train, transfers or the car and hassle of parking; Let Big Green Coach take you straight to the festival with a load of your metal brethren. You can also secure your official, low-cost Bloodstock travel with only £10 deposit. Enjoy the entire festival without having to worry about your Monday morning journey – plus you will make friends, save money and go green! You can get straight to the festival site from 34 locations around the UK. Can’t find a pick up point close to you? Fill out this form HERE and if there is enough demand, Big Green Coach will put on additional services. Make your way to Birmingham New Street railway station. From Birmingham New Street station take the train to Lichfield City. This journey should take approximately 35 Minutes. Lichfield station is 7 miles from Catton Hall and is about 15-20 minutes drive. Life's a journey - share it! If you would like to reduce your carbon footprint, help other people travel to Bloodstock and save money, why not offer your empty car seats to others on goCarShare? goCarShare is built around Facebook; you can login quickly and look at people's profiles before deciding whether you would like to travel with them. goCarShare is a green, fun and good value way to get to Bloodstock. You can add a car share request right here. GOCARSHARE TO BLOODSTOCK AND BE IN WITH A CHANCE TO WIN FREE TICKETS TO BLOODSTOCK 2019 ... thats good karma for sharing. Catton Park is 20 miles from either Birmingham or Nottingham East Midlands Airport. 60 miles from Manchester and 130 miles from Heathrow. Get the latest information on travel conditions and any congestions issues when journeying to the festival or heading home from the festival by clicking HERE ! Live traffic data from The Highways National Traffic Control Centre. For people heading home after Bloodstock you can now get updates direct to your mobile, or simply go to the app store and download Highway England Live traffic info. We strongly recommend to use these 2 Taxi firms below to and from the festival site as they are our preferred Taxi operators and have agreed preferred rates for Bloodstock patrons. These rates are per taxi, not per person.